distances(distances>22) is giving distance values. between which coordinates those distances are greater than 22? So you want to obtain the x and y coordinates when distance is greater than 22 ? Then, F(p1(i),:) and F(p2(i),:) (for i = 1, ..., numel(p1)) will give the coordinates (x1,y1) and (x2,y2) whose distance are grater than 22. Are p1 and p2 are indices correspoding to matrix F?? distance between first row of xn and first row of yn is greater than 22.
distance between second row of xn and second row of yn is greater than 22. Let me clarify with the following simple 4 coordinates example (i.e assuming your matrix size of F is 4x2). In this case, the coordinate D has a distance greater than 22 from all other coordinates. On the other hand, the coordinates C has a distance > 22 against A and D but < 22 against B. In this case, what you want to do is to find the coordinates D? 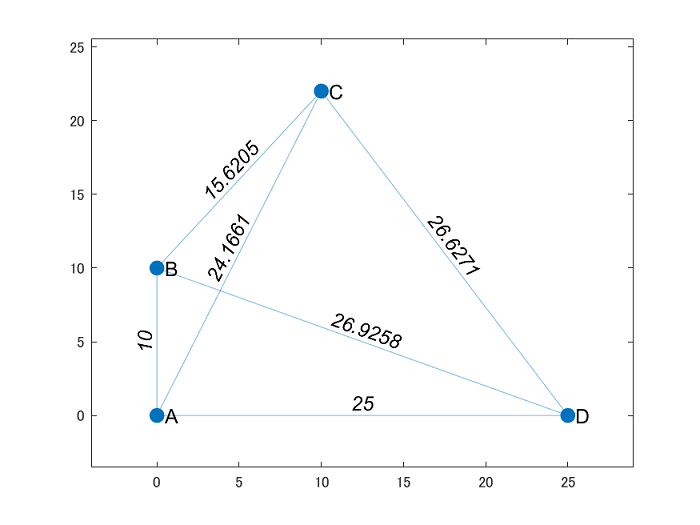 or to find all the edges that has a distance > 22? In the above graph coordinate B voilates the condition i explainbed above, where as if we remove coordinate B from graph Coordnates A,B,C satisfies the condition i explained above.